This styled shoot for expected twins was styled by Silk and Cedar Events in Melbourne on behalf of Life's Little Celebrations and featured a number of talented vendors in the collaboration. 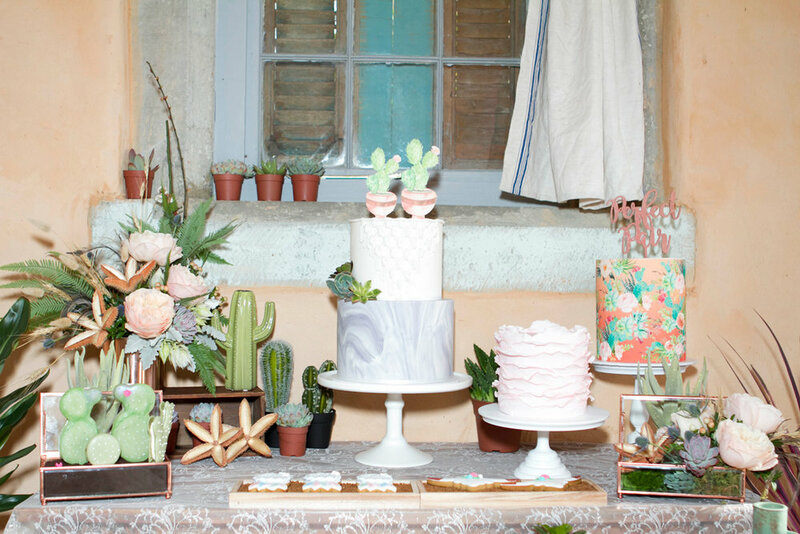 With a pretty feminine palette of soft pinks and cacti greens it has a beautiful spring vibe and presents an elegant spin on this theme. The invitation design by ELK Prints sets up the story for guests. On the front the couple hold up a pair of near-identical reversed cactus pots - each one is painted separately to highlight the subtle differences between the twins. On opening up the invitation, the inside reveals a desert scene with portraits of the parents and all the essential party details. 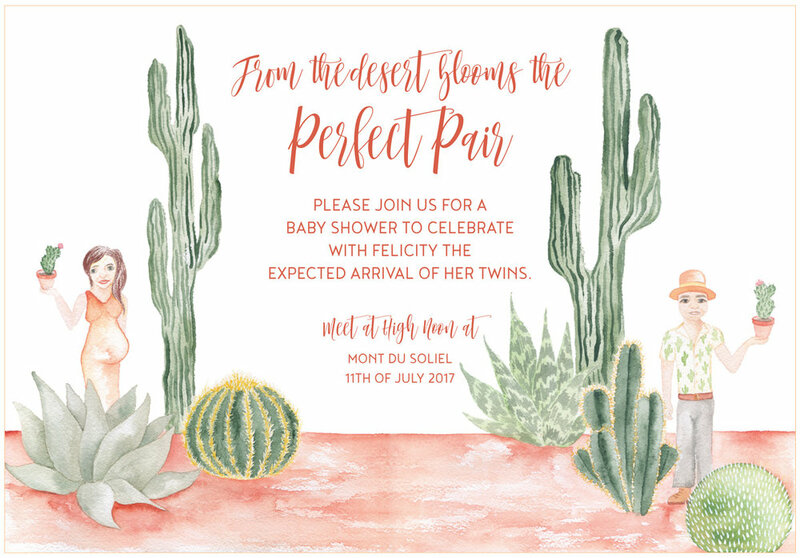 The central main invitation by ELK Prints features a desert scene with the parents to be on either side holding aloft the symbol of their expectant twins. 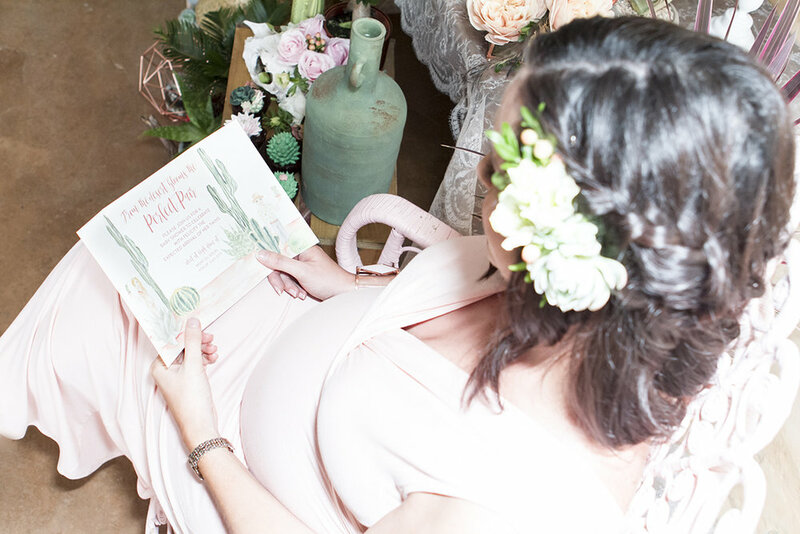 The concept of “from the desert blooms the perfect pair” was created in honour of all mums and dads who are struggling with issues of fertility. 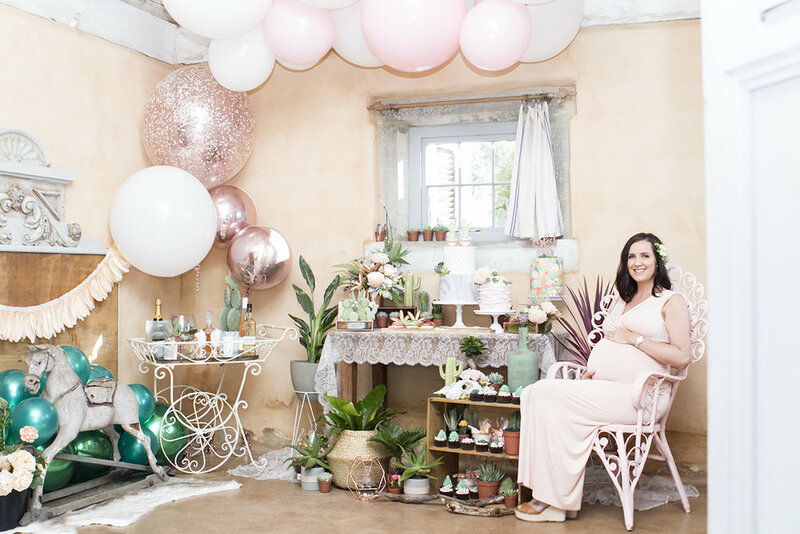 We chose to showcase ‘from the desert’ representing the difficult journey and hardship they have gone through to fall pregnant and blooming reflects their joy and happiness in celebrating the precious life they have created. It is not unusual for IVF babies to born as twins so that formed part of the story we created also. This is reflected also with the line “the perfect pair” and symbolised by the prickly pear cacti. Succulents paired with wild roses are a beautiful textural centrepiece for the table. 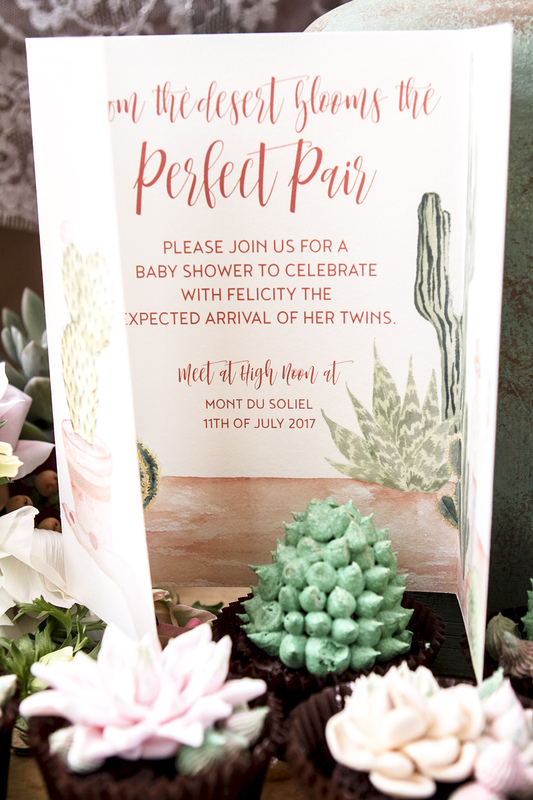 The cactus shaped party plates by Meri Meri from Favour Lane Boutique are a perfect choice for this theme. 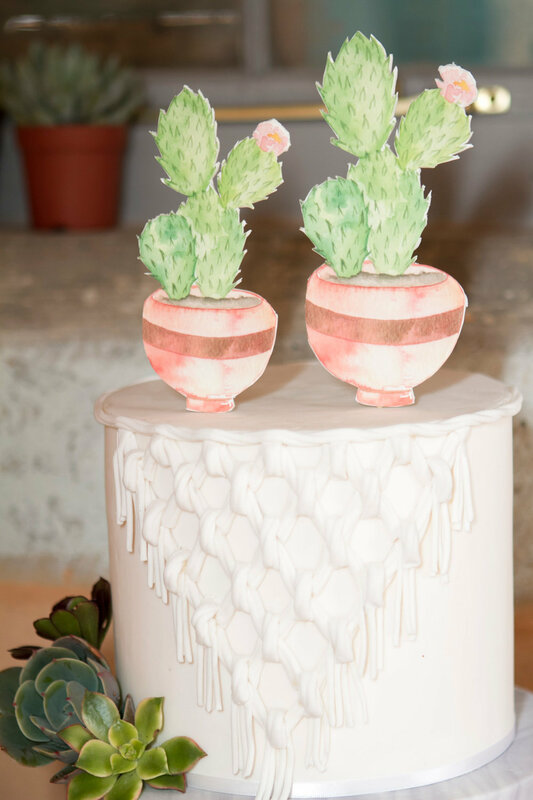 Cacti pots make a perfect gift for guests that add colour and texture during the event itself. This cake design by Taylor Made Gourmet features a subtle decorative macrame design in fondant and is complemented by the cake topper design based on the watercolour illustration by ELK Prints. I love this tranquil spot where the mother-to-be can just relax and swing and ponder the future joy coming her way. Outside the venue a custom sign from ELK Prints welcome's guests and sets the scene for the day's event. 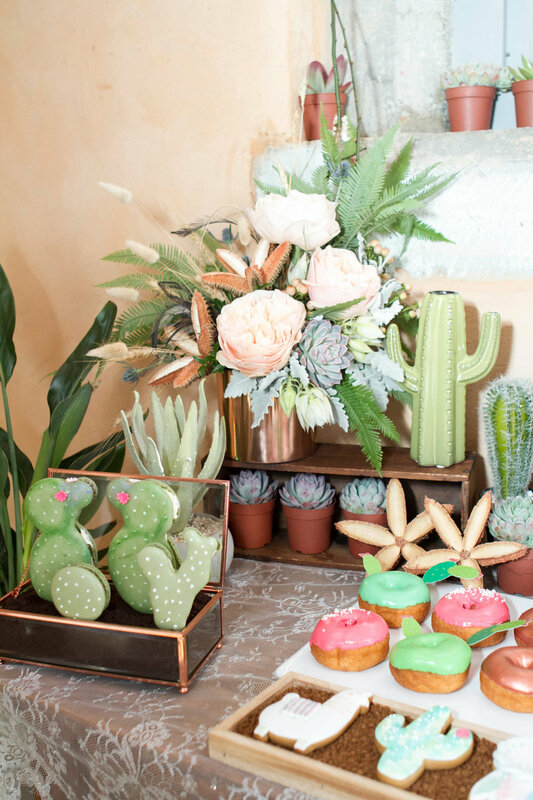 Fairy floss favours and cacti cupcakes.